This stunning location on the Greenwich Peninsula is home to an inspirational learning environment. It features a series of interlinked floors around an impressive central atrium. BREEAM Excellent status. 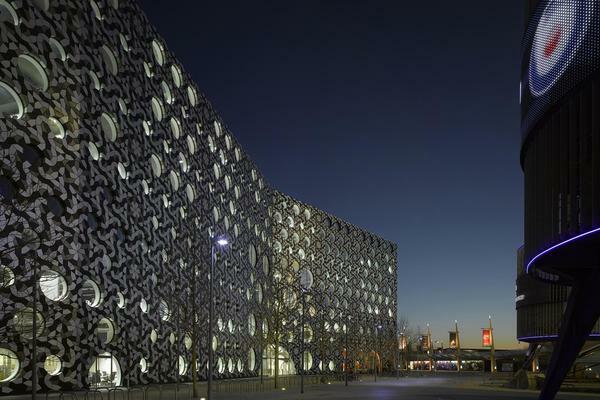 RIBA Award Winner 2011. The 17,000m2 structure, which provides specialist teaching facilities for 1,400 students as well as 140 members of staff — has been designed to stimulate the local environment and the working practices of future creative professionals. The building had to fit into a masterplan dominated by the Dome and comprising a series of crescent-like radiating bars. Because of the funding structure of the college, the building also had to be convertible into an office building. 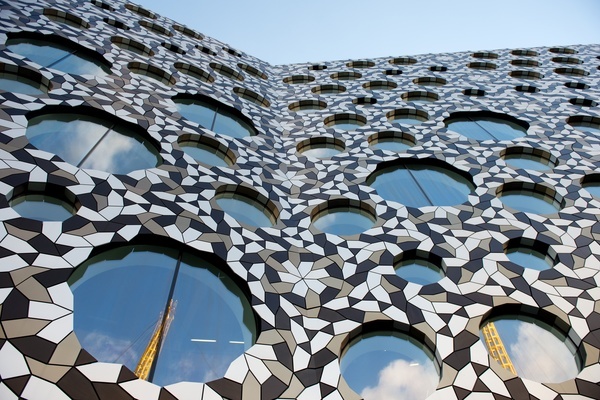 The facade features 28,000 anodised aluminium tiles which are wrapped around the entire structure. They are made up of Penrose tiling, a complex but non-repetitive pattern invented by Sir Roger Penrose, an Oxford university professor. This abstract pattern has allowed the design team to build seven different types of windows out of only three different tiles. The pattern of the tiles is determined by the size and positioning of window openings, while the size of windows depends on the corresponding interior function. The building is roughly rectangular with a slight crank on plan down the middle. Internally the building is then divided into three main sectors, with both the east and west wings constructed with concrete, while in the middle, straddling the crank, there is a central wedge constructed with steel and precast planks. The central wedge or hub, remains largely exposed leaving the steelwork as an architectural feature. The atria have been systematically attached to the external façade in order not only to use them as ventilation spaces, but also to connect visually to the core of the building. The north atrium extends upwards from ground floor level to third floor, while the adjacent southern atrium sits above a lecture theatre and media centre and consequently begins at third floor level, extending upwards to the roof.